Nissan’s popular Navara line-up of practical and rugged utilities gains a new look dual cab range with the soon-to-be released D40 Navara. The all-new D40 Navara is bigger than ever before. It projects a modern, rugged look and feel, clearly expressing Nissan’s design DNA through its chrome, angled strut grille, short front and rear overhangs and large fender flares. 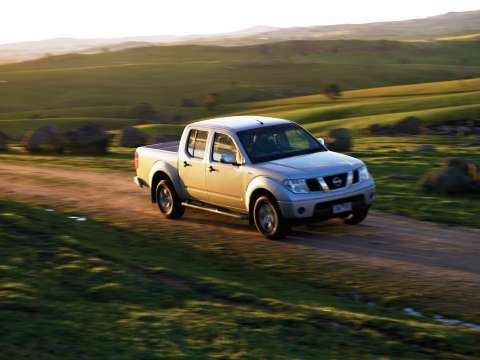 Available in 4x2 and 4x4 drive-train configurations, the D40 Navara is powered by either a 4.0 litre V6 petrol or 2.5 litre common rail turbo diesel engine. The potent 4.0-litre DOHC V6 petrol engine generates 198kW @ 5,600rpm rpm and 385Nm @ 4,000rpm. The flexible yet refined 2.5-litre common-rail turbo diesel engine generates 128kW @ 4,000 rpm and a massive 403Nm of torque @ 2,000 rpm. Both engines are available with either a new six-speed manual or a five-speed automatic transmission. Like the Pathfinder, the Navara features a rugged ladder-frame chassis and a refined independent front suspension system featuring double wishbones and coil springs. A rigid axle and over slung leaf springs at the rear are designed to give the Navara the best possible payload levels while providing SUV-like ride, handling and comfort. The practicality of the new Navara is further enhanced by the C-Channel utili-track system. This factory-fitted system incorporates five rails (one channel on either side of the load floor, plus one on each of the three fixed sides of the pick-up bed) into which self-locking cleats can be placed, providing fixed points for securing ropes and a full range of bespoke accessories designed to work with C-Channel. The new D40 Navara will be sold alongside the existing D22 Navara as part of a dual sales campaign aimed to give customers even greater choice in a very popular market segment. The new Navara can be seen on the Nissan stand in Hall 3 at the Australian International Motor Show until 23rd October.